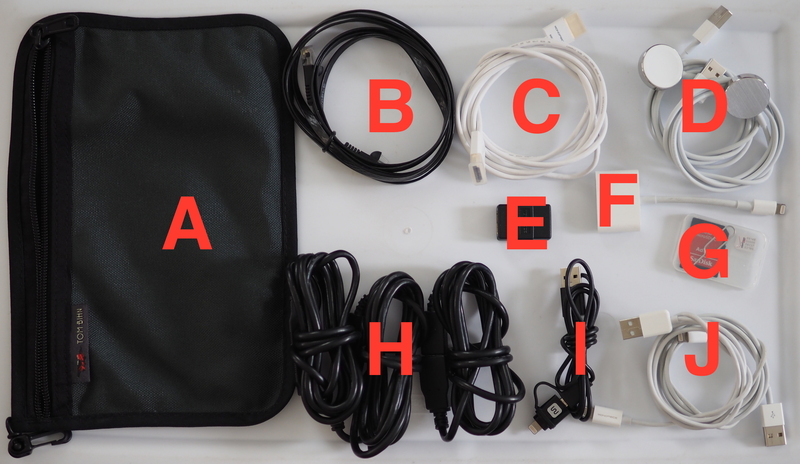 A year ago, I shared my “go pack”, which is a small bag that I keep loaded with the various cables I need when I travel. Having my go pack ready to go at any time makes me that much less stressed about traveling. This is the pouch that all of the other items pictured live in. I have an unhealthy obsession with laptop and iPad bags; Tom Bihn is quickly becoming one of my favorite brands. Sturdy, functional, well designed. This is a very slim Ethernet cable, which I like to bring with me to hotel rooms. Hotel WiFi is notoriously bad, but some hotels still have Ethernet jacks in their rooms. This allows me to connect in an often much more reliable (and comparatively snoop-resistant) way while adding little bulk to the pack. Most hotel rooms these days also have flat panel TVs, and these nearly always have a free HDMI port. Like the Ethernet cable above, this HDMI cable is super slim and light, which makes it no burden at all to carry. Curiously, however, this HDMI cable is directional. Apparently the RedMere technology that allows it to be so slim requires the cable to be directional. When I first tried using the cable I thought it was DOA, until I looked closely at the connectors and saw they were labeled. A new addition, I’m now carrying two Apple Watch charging cables. Originally, I tried to get by with just one, thinking that more often than not, it would be just me traveling, and there was no need for another duplicate Apple Watch charger for Erin. As it turns out, I was wrong. We almost always travel together, so I am carrying two chargers. The ones that come with the Watches never leave home. Though I haven’t actually needed it yet, I thought it may be nice to keep one of these around just in case I find an occasion to use it. Small in both size and price, it’s easy to carry it just in case. Earlier I mentioned the HDMI cable, so what video/audio am I running through it? This (really expensive) adapter allows me to connect my iPhone or iPad to the TV in the room to play whatever I want. I’ve used it to play media on the device, Plex, Netflix, my Slingbox, etc. As I’ve talked about several times in the past, I typically keep a T-Mobile SIM in my RetinaPad Mini, but occasionally find myself in situations where I need reliable coverage. Should that happen, I can pop in the Verizon SIM it came with, and pay for service on it. The SD card is really there because I like keeping the SIM in that case. Having a trio of these around makes charging phones at night way nicer. Since the Dynex power strip is likely near one side of the bed, these two extensions hooked together provide for an extra 12’ of slack on the standard charge cable. This way both Erin and I can have our phones on our respective bedside tables. Additionally, I’ve found that since hotel power outlets are often nowhere near the bed, I like to have an extension for my phone as well. Thus, I carry a third. Two get linked for Erin, and one used alone for me. These extensions are also driving me nuts. They make up a tremendous portion of the volume of the go pack. I have been searching for slimmer USB extensions to use, but haven’t been able to find any. This cable has two ends on it, a Micro USB for charging miscellaneous other accessories such as a battery pack, as well as a standard Lightning charger. Kills two birds with one stone. I also carry two standard USB to Lightning cables. The ones pictured are from Monoprice, and they’re my preferred third-party lightning cable. They’re sturdy, but the Lightning side is also thin enough to fit in most standard cases. I’ve had far worse luck with the Amazon equivalents. Not pictured, I also just picked up an Anker 5-port USB charging station. I long resisted doing so, because I preferred carrying a slimline power strip. However, upon adding two more USB devices (our Watches) to the mix, I finally gave up and got this charging station. I chose the 5-port because both Erin and I have a phone and a watch, plus my iPad, makes 5. The updated total cost of the bag plus the charging station was around $200, not including the Fire TV Stick. That’s a lot of money. However, it was worth it to me to know that at any time, I just have to grab the go pack and I’m ready.